Our aromatherapy massage oil conditions your skin and soothes your tired muscles with our unique blends of soybean, rice bran, sesame, sunflower, vitamin E and gentle aromas. Enjoy a relaxing massage or add a few drops to your bath for a sensual bathing experience. 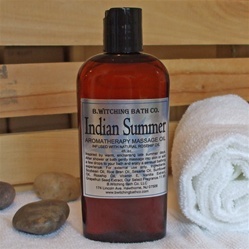 Our Indian Summer formula was inspired by enchanting late Summer days, showcasing aromatic notes of amber, spice, musk and vanilla warmth. 4 fl. oz. Aloe barbadensis Juice, Meadowfoam Seed Oil, Menthol, Capsicum, Peppermint Oil, Basil Oil, Black Pepper Oil, Roman Chamomile Oil, Cinnamon Oil, Citronella Oil, Eucalyptus Oil, Helichrysum Oil, Ginger Oil, Grapefruit Oil, Juniper Oil, Lemongrass Oil, Pine Oil, Ravensara, Rosemary Oil, Spearmint Oil, Oregano Oil, Camphor, Kosher Vegetable Glycerin, Hamamelis virginiana Distilate, Phenoxyethanol, Carbomer, TEA, Tetrasodium EDTA, Citric Acid.